The 30W Spot can be mounted on standard single and 3 circuit track . 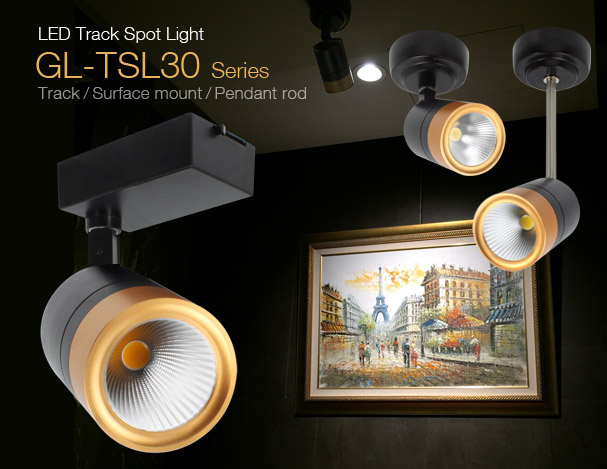 LED Track Lights can be used in various places to illuminate paintings on the walls or products in retail stores. The fittings are placed onto track which is installed on any surface. This is a trully versatile lighting solution. A warm white CITIZEN LED Chip emits uniform warm white light, thanks to the diamond shape reflector the spread of light is 38 degress. Rotating base 360° horizontally and 90° vertically. Available with surface mount and suspended kit. IES Files and photometric data are available upon request.